Artisan cookies are not just gourmet cookies, but a special creation, hand made with ingredients from local farmers and craftsmen. A taste that satisfies your desire for the best possible cookie combined with a gift experience that feeds the soul. These cookies are made with sprouted wheat flour, a unique method developed by our friends at Lindley Mills where the wheat is first sprouted, then dried and finally ground into flour. Nutritionally, your body treats this more like a vegetable than a starch. The eggs come from a local, family-owned ranch (not a corporate farm) where all chickens are raised without cages and are never fed animal by-products, hormones or other drugs to enhance egg production. We use organic butter - no hormones, stimulants, or other artificial chemicals to enhance milk production. These cookies are baked to order and shipped the same day. For that reason, we strongly recommend selecting USPS Priority Mail, especially for shipments to West Coast destinations. 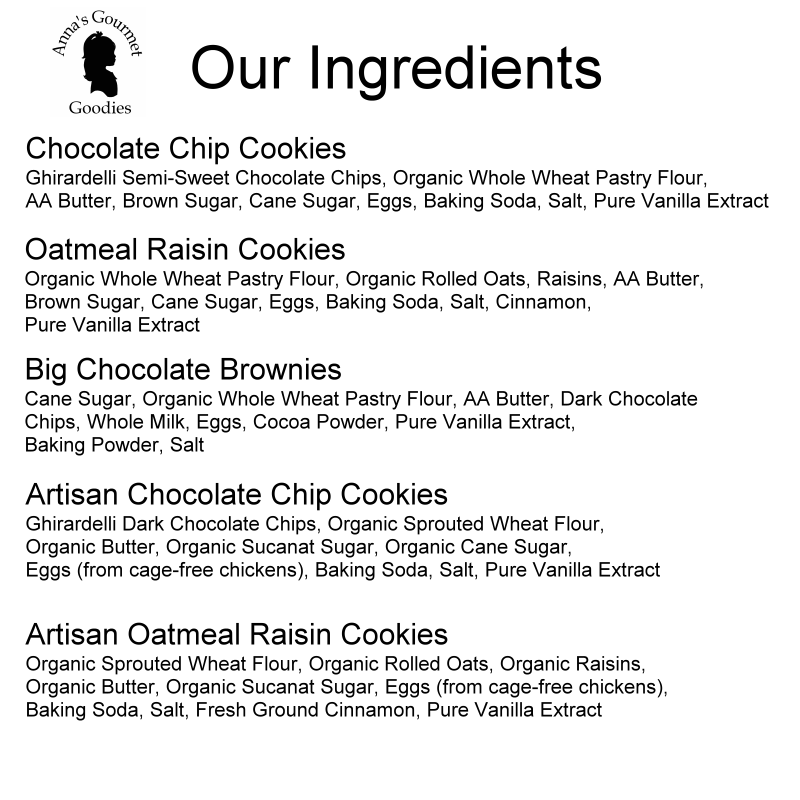 Fresh-baked goodness in both the chocolate chip and the oatmeal raisin cookies! The cookies were fresh and delectable, as always! I placed an order and didn't have an option for a shipping address and then realized the order was placed without a shipping order so it was scheduled to be shipped to me. I called the number to have things fixed and the gentleman on the phone was not too helpful or friendly except to tell me to send an email with the correct shipping address. To date o haven't received anything that says the shipping address was changed to the correct information or even if the item was delivered to the corrected shipping address to date because no confirmations of anything have been received. Thanks for taking the time to give us feedback. Our site does have an option to add a shipping address, however, it defaults to shipping to the billing address. You can un-check the box and enter a single shipping address or multiple addresses if you are ordering multiple products. We’ve added more notification emails for order status updates, so customers will get emails with tracking numbers when the status of the order changes. For changes to an order, we try to get that from customers via email as it helps us avoid spelling errors and get everything just right. We’re sorry for any inconvenience with your order – it was certainly not intentional. We strive to make each customer experience the best it can possibly be and your feedback will help us improve.